Update 23 March 2007: Firewall when ready! Brad's got a bunch more of the small-parts tooling for the Glidair, and has finished a first-article firewall bulkhead. He's also installed a full set of ring stiffeners in the aft fuselage and made parts for the engine cowling. 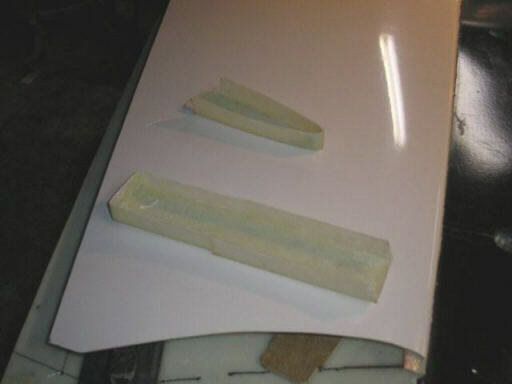 First article parts for the horizontal tail attach inside the vertical fin. 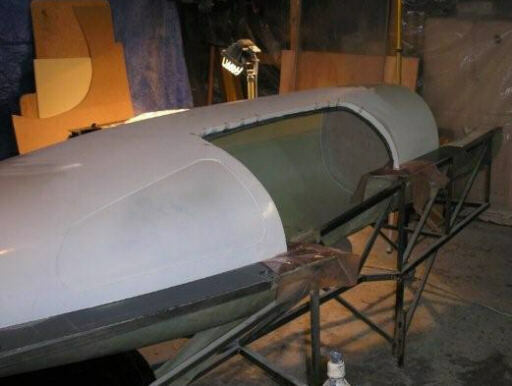 Fuselage shells temporarily mated, with firewall in place. Note the recess behind the canopy opening, one of two for acrylic windows. 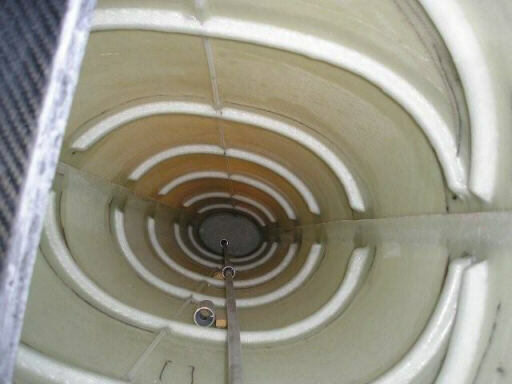 A look down the aft fuseage from the cockpit. 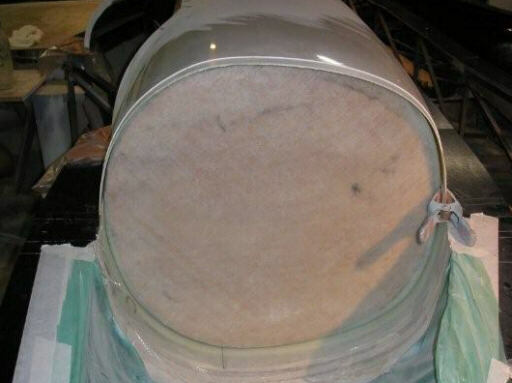 The EPS foam stiffener cores I designed have been working out great. Just hot-glue on, cover with a couple ply of glass, and bingo--instant ring bulkhead. The firewall bulkhead. 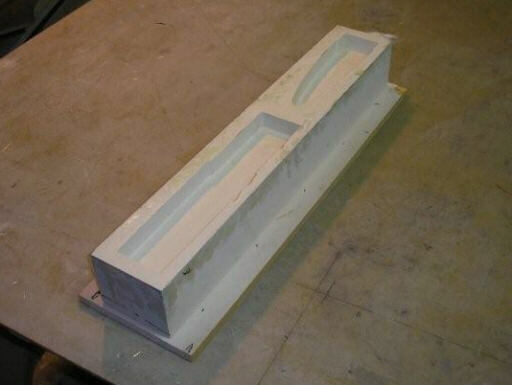 This is a molded fiberglass part with 1/4" plywood core. The actual firewall is a sheet of stainless steel not yet mounted. The full plywood core is a bit of overkill; we can probably cut away a lot of the plywood once we know more about the engine installation and what needs to mount onto the firewall. But until then, it seems a good development practice to just leave it all there. The left side of the engine cowling. 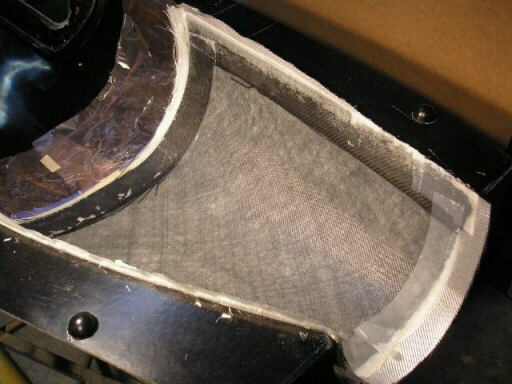 This is a fiberglass part with carbon fiber edge tapes. The CNC-cut tooling for the horizontal tail attach parts. Homebuilt aviation is not for folks who don't try stuff at home.